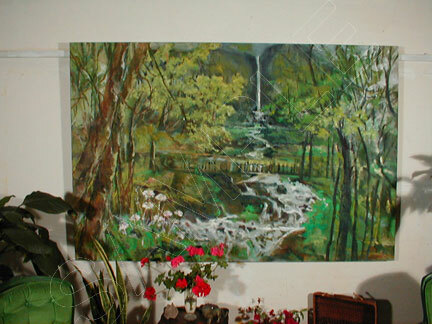 View Susan's entire Water Lily / Waterfall paintings gallery (below) in a separate window if you wish. Infinity Studio opened forty years ago and Susan is still a working artist after all this time because she loves painting. 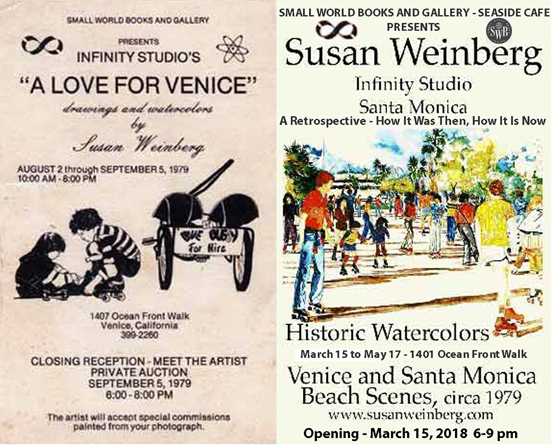 Things have changed but we are still here and have been getting ready for a retrospective exhibition of Susan's Venice and Santa Monica watercolors as part of the Venice Art Crawl. The show opened on March 15, 2018 and the response was encouraging. The show is being hosted by Small World Books & Sidewalk Cafe in Venice. This is where Susan first showed them in 1979, just a few years after Bob and Mary Goodfader opened the book store. To kick off this event there had been a number of gatherings of artists, art lovers and other interested people. 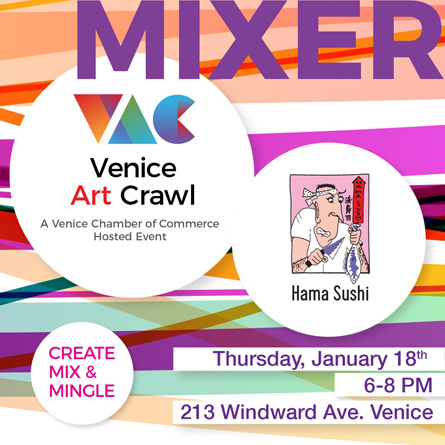 On January 18, 2018 one of these mixers was held in a sushi restaurant & bar on Windward Circle. It was packed. We were like sardines in a can but we had a good time eating and drinking, meeting and making friends while reminiscing about Venice and talking about the upcoming event A Retrospective - How It Was Then, How It Is Now. We hope that you can come to the show which runs until May 17, 2018. On opening night we not only showed the watercolors but there were other interesting presentations. We want to show you that even though things change other things stay the same. Even if something, a place, or a person, it could be anything, looks unrecognizable all you have to do is look at it in a certain way and suddenly you'll see it. In some subtle or stark way things are really the same. What has changed is the presentation. Come see our presentation of How it Was Then and How It Is Now. You will enjoy it. The show will run for two months so even though the opening is past you can still enjoy the artwork and the slide show can be seen on the retrospective web site. If you are interested in purchasing some artwork or commissioning a custom piece please feel free to contact Susan directly at (310) 392-5042 or infinitystudio@aol.com or through our Historic Watercolors site. All this work and excitement just goes to show that even though some things change other things stay the same. Yes, some things have changed and it is very sad but Susan is still a working artist even though Infinity Studio had to move. Sadly we lost our prized location next to the Santa Monica Pier. There was no way to stay there even though we all hoped to make it to our forty year anniversary in the same location just as Small World Books did. Well, we came close. Thirty eight years is not bad. It was two years ago that Infinity Studio was forced to close and we moved to downtown Santa Monica. Since then Susan has done some very amazing work. Susan's other paintings web site showcases some of her newer work. If you wish to visit then please do so but be sure to return to Infinity Studio. There is so much to see here. You will also learn about Susan, her philosophy and what drives her to produce such amazing artwork. We appreciate everything you art lovers do to support the arts. As you may know we not only display on this web site the work of Susan Weinberg but we also showcase new and exciting artists from time to time who have worked and studied with Susan. Since the relocation Susan continues to work on the very nice new series of Water Lily / Waterfall paintings you may have seen above. We did a number of field trips to gather plants and flowers and take photographs. She used these as inspiration for these flower compositions. Up until we were locked out, because of the December 12, 2015 fire upstairs, they were being shown in the front of the Studio and everyone who viewed them had enjoyed them a lot. Susan has also produced a large body of smaller work on the same theme which will be posted here soon. She has produced some work on single canvas while others are multi part cascaded work. Look for them here in the near future. Of course Susan not only paints but she continues to teach. Susan is still improving on a project that started many years ago - a leather restorative that is truly amazing. She developed this product while designing her paints for decorative work. It uses the same technology and method (chemicals / pigments / binders etc) as she developed for her Hand Painted Fabric. Actually from the beginning it worked on leather as well as textiles and even wicker work and wood. Now Susan has modified the formulation so that it can be applied to worn, cracked and faded leather. It gives a new life to worn-out leather furniture, bags, jackets and such. 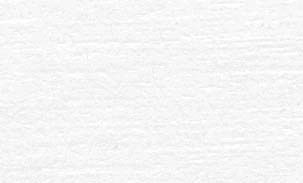 Unlike a regular leather paint that simply covers and colors, this product rejuvenates and restores. If you are interested in see examples, before and after of a simple "brushed on application" please contact us. We will continue to feature other significant events on this site which you will no doubt be interested in seeing. So come back regularly. Susan Weinberg is a classically trained artist who combines her background in the fine arts with her knowledge of chemistry to produce amazing works of art in unusual mediums. Her watercolors have a traditional look. In reality they are much more than a look at daily life at the beach. They document a simpler, more eclectic time in the history of the Santa Monica - Boardwalk / Pleasure Pier and "The Venice of California". The technique she developed for painting them is still used by her and her students more than thirty years later. She pioneered a technique to produce hand painted fabric that has a three dimensional quality, is soft and supple yet resists staining and is durable as can be seen in these examples. Susan paints in oil and acrylics and achieves a unique look through her use of metallic elements and organic and mineral compounds. Photographs just do not do them justice but you will find it stimulating to examine them anyway. In addition to original works of art, Susan has thirty of her watercolors available as giclee prints. It is possible to re-create any painting in giclee print form on any material from canvas and paper to metal, plastics and wood and to any size you desire. So, for example, in commercial use in hotel rooms Susan can take an idea or two and create work in different colors, sizes, materials, etc., so that suites of rooms can have individualized art on the walls. Homes have their own special needs. Susan looks forward to working with you. Her motto is: "What can be conceived can be achieved." Please call and discuss your painting and design needs with her at (310) 392-5042 or E-mail. For thirty eight years Infinity Studio was located next to the famous Santa Monica pleasure pier in beautiful Southern California. This scenic location provided inspiration for Susan and her students. One of Susan's loves is teaching in the studio, along the ocean front boardwalk (that runs right past the front door), on the beach and at various scenic locations nearby. 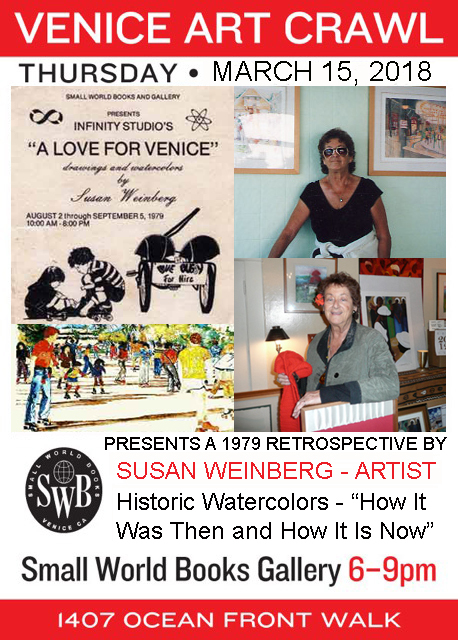 Susan Weinberg is one of the founders of the Association of Venice Artists (AVA), which established the first Venice Art Walk in 1978. In 1979 a short film, available on YouTube (in two parts) and also from the New York Times Movie site, titled "Susan Weinberg - Artist" was made that highlights her work and outlook. 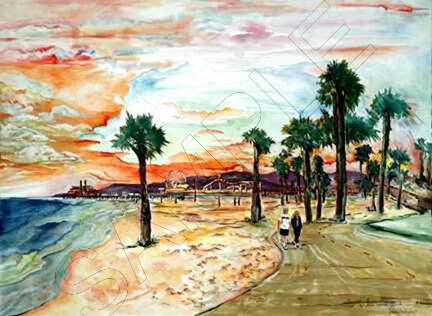 As of 2010 Susan is the only professional artist who has been able to remain on the beach front. As Vice-President of Artists for Economic Action in Los Angeles, Susan was able to orchestrate many art project, has been on Grant committees and has juried many art shows. During her seminar at the University of California Santa Barbara, Susan demonstrated her color mixing techniques then evolved the seminar into a workshop. A great many of her students have become successful in the art field. Her Hand-Painted Fabrics have appeared in 35 different designer showrooms across the country, from Beverly Hills to Miami, and have been installed in the best hotels, clubs, homes, banks, yachts, airplanes and more. She has produced various Murals along the beach front. Susan's clients have included Carnival Cruise Line, Executive Aircraft, Home Box Office (HBO), The Smithsonian Institute, Aaron Spelling and George Lucas. She attended Northwestern University and the University of Wisconsin, receiving a B.S. in Science, Home Economics / Education; and a Bachelors and Masters of Fine Arts degree in Painting and Sculpture from Otis Art Institute, Los Angeles, California. "After completing my studies I began traveling my own path. To me art is not just a thing you do, it is an extension of your life, your vision" Susan explains. She continues "I have a love affair with paint, and developed ways of mixing paints with various ingredients. I can control my paint so that it is soft to the touch for fabric and clothing, firm for canvases and wall pieces, glowing with iridescence and luminescence, and I can control the bleed of paint into paint on wet surfaces." The scientist in Susan has caused her to constantly experiment. 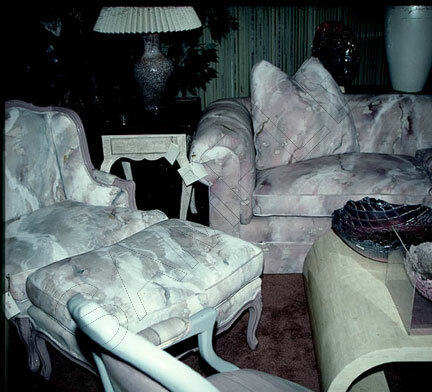 Susan's "Marbleized" fabric put her on the map with her novel painting technique. 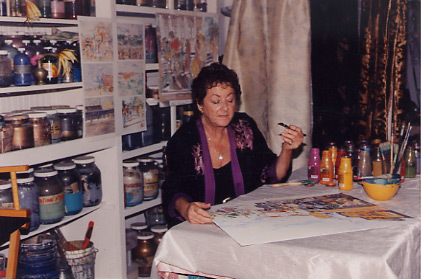 She developed a technique, now used by many artists - many of whom she has taught, to project images on all kinds of mediums to create true to life but not photo realistic paintings and watercolors. Susan is not necessarily only interested in image or subject matter, but more in what paint does: how it moves, how it separates on the paper or fabric; how paints move into each other when wet. According to Susan: "An artist shouldn't be afraid to experiment and make mistakes. Sometimes by putting two mistakes together you create something new." Please feel free to enter our online galleries and work shops. There is also a new slide show of photographs of our neighborhood, as it is today, which is part of the production process of an upcoming series of watercolors. Contact us if you are interested in purchasing or commissioning a work. We are also taking students on a regular basis. One project Susan has been working on for some years now is called "Painting For Health". You will be reading about this and other exciting new projects regularly in these pages. So check out Infinity Studio at www.susanweinberg.com often.